The Skinny: Korean history and jingoistic fervor collide in Hanbando, a highly-charged political thriller that fails to capitalize on its crackerjack, Da Vinci Code-inspired premise. Long-simmering national grudges get played out cinematically as Korea and Japan square off with one another in Hanbando, a misguided political thriller that seems to be more concerned with settling old scores with the Japanese than actually telling an exciting story. What's worse, while it has all the makings of a decent potboiler (impending war, internal conspiracies, and the good ol' "race against the clock" timeframe), Hanbando squanders much of that potential in favor of an exceedingly one-dimensional view of patriotism that, while understandable considering the bad blood between the two countries, is probably more inflammatory than it needs to be. 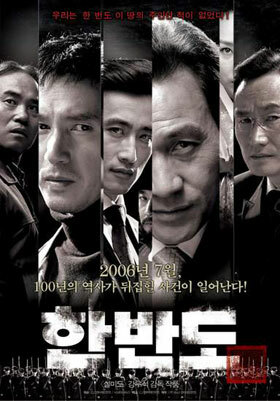 The film speculates as to what would happen if the long-talked about North and South Korean reunification actually occurred. How would it be received by the rest of the world? Not well, if Hanbando is to be the judge. After a bit of newsreel footage mixing real and fictional clips, we pick up in a near future reality where North and South Korea are getting awfully chummy with one another. As a gesture of mutual goodwill, they decide to reopen an old railway that will once again connect the two Koreas. It's a political move that results in lots of handshakes and smiling faces across Korea. Sounds good, right? Well, not everybody is pleased, least of all Japan. With reunification just around the corner, Japan decides to flex some political muscle, claiming that it owns all the rights to the railway. They base their claim on some official documents stamped by the royal seal of Korea's King Gojong nearly a century ago. To further demonstrate their power, Japan threatens to impose economic sanctions and even sends its naval fleet to Korean waters, ready to invade if the two Koreas decide to proceed with their plans. Although some in his cabinet are willing to accede, the Korean President (Ahn Sung-Ki) is not at all eager to kowtow to the demands of the Japanese government. Luckily for him, he crosses paths with an outspoken history professor named Choi Min-Jae (Cho Jae-Hyun), who has long claimed that the royal seal used on these documents is a fake, making Japan's so-called rights to the railway null and void. He believes he can find the real seal, thus allowing the railway to be opened and, perhaps better yet, shaming Japan in the progress. The President gives Choi his full support, but there are parties working within the government who would like nothing better than the royal stamp to remain buried, if not outright destroyed to preserve economic ties with Japan. With war looming on the horizon, Choi races against time to discover the lost artifact and save Korea from the foreign horde. Hanbando scored big numbers at the local box office, and it's not hard to see why. In theory, it combines feel-good patriotic sentimentality with a crackerjack, Da Vinci Code-inspired plot. But in my view, the two elements aren't integrated very well. The pro-Korean attitude coupled with the anti-Japanese sentiment is perhaps understandable considering the history shared by the two countries. But as an outsider, I found it hard to determine where historical accuracy left off, and propaganda began. There are a lot of inflammatory scenes, particularly one in which the Japanese (in a flashback to the distant past of Chosun Dynasty), slaughter an entire houseful of defenseless, unarmed women. And while the Japanese officials in the modern day sequences aren't quite as bloodthirsty, they are similarly unsympathetic. But all that anti-Japanese fervor would be forgivable if the filmmakers actually capitalized on the potential of its rollicking-conspiracy theory premise. I don't have a problem with cinematic depictions of patriotism nor taking Japan to task for its many atrocities; it's just how Hanbando chooses to go about it. Certainly, genre thrillers sometimes need simplistic divisions of good and evil to make their point, and if the Japanese are required to serve as the moustache twirling bad guys for Hanbando, so be it. The problem is, the film doesn't make you forget about how purposely divisive it is by submerging you in the plot. The whole concept of the lost royal seal that will rewrite history is a compelling one, particularly with the threat of war hovering over the proceedings. The disappointing part here is that the film never really feels as exciting or inventive as it should be. From a casting standpoint, Ahn Sung-Ki is a commanding presence as South Korea's president, and Cho Jae-Hyun makes for an acceptable, if somewhat ordinary protagonist, but there's not enough here performance-wise to make Hanbando in the least memorable.